If you're looking to deceive local law enforcement by way of a phony license plate, your forged vehicle ID probably shouldn't come from the remnants of last night's pizza delivery. 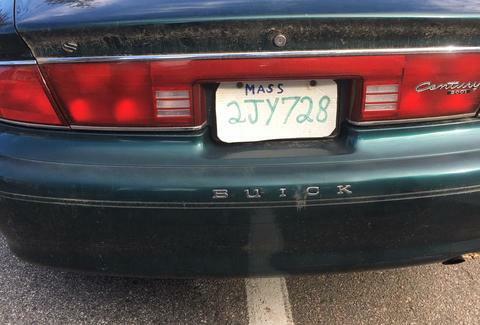 But because the universe unfolds in equal parts mystifying and utterly depressing, a motorist in Massachusetts decided to fashion a license plate out of cardboard from a pizza box, filling in the numbers with a vibrantly-hued magic marker. Making an example of the driver and unintentionally paying tribute to the folly of man, the cops broadcasted the charges on Facebook, which include "operating an uninsured and unregistered vehicle and attaching 'fake home made' plates." Although trumpeting their work as an example of imperious policing, the cops pretty much performed what anyone with a functioning pair of eyes would have done when confronted with a pizza box license plate. For one, the replica plates only say "Mass," which is a dead giveaway that they aren't even approaching legit. And as Vice points out, the plates' green lettering is a glaring indication of some terrible craftsmanship, as the states' license plates have letters written in red. With law and order restored on the streets of Hopkinton, it isn't likely that another pizza box will be used as fodder for a dumb trick that leads to a criminal charge. But then again, we can't really be sure.